Last month, I spoke about the critical investment we make in our employees through our leadership training programs. This month I want to continue that theme by writing about the investment we make in our employees through our comprehensive safety program. We take safety seriously. We have spent decades developing and refining our safety program and we allocate resources to make sure that our employees have the best training, equipment and knowledge to perform their duties safely. And we never stop refining. We develop our safety classes in conjunction with a professional OSHA consultant. Every class is tailored for the work we do and every class meets or exceeds all OSHA water/wastewater regulations. PeopleService wins the George W. Burke, Jr. Facility Safety Award for 2018. Our safety program was recognized earlier this month when we received the 2018 George W. Burke, Jr. 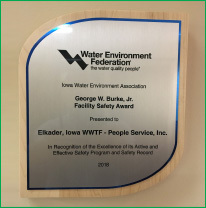 Facility Safety Award from the Iowa Water Environment Association. This award is given to those who have a documented program and who have illustrated the implementation of that safety program and have a demonstrated safety record for the preceding year. Of course, the most gratifying reward is the knowledge that every day, our employees go home without having sustained an injury during their day’s work. That return on our investment is worth every dollar we spend. We’re here to work with you safely. Contact me anytime to discuss.